For those who grew up during the time when owning a Nintendo console made you the coolest kid in your neighborhood, Mario Kart was a game that created and ended friendships in equal measure. It wasn't your conventional racing game, nor was it grounded in any sort of reality, but it's cartoony style of play and myriad of track weapons made for many a fun afternoon. If you were a fan of the game, or you still play the newer versons today, these new toys from Hot Wheels might interest you. Mashable reports that Mattel, the company behind Hot Wheels, unveiled these new toys at this year's San Diego Comic-Con. The lineup features most of the game's characters like Mario, Luigi, Wario, Bowser, Peach, and Toad. We're hoping for a Donkey Kong version at some point. Oh, and deployable turtle shells. The toys will hit shelves in June 2019 for $4.99 (P266) each. 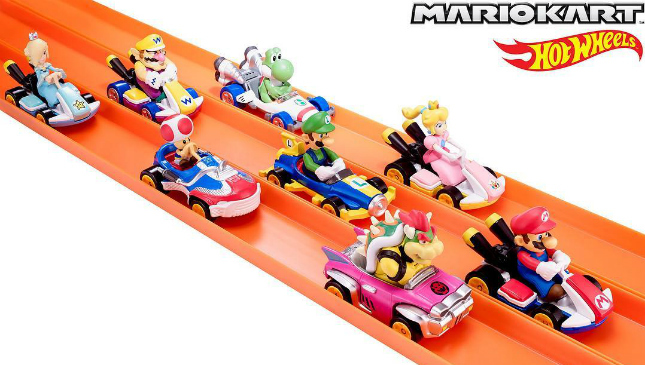 Mattel will also release tracks for the toys based on the ones in the games. That could go one of two ways: innocent fun with toys, or heated races that will remind you of those friends you used to hang out with. Either way, we're sold.